YES! We are writing the Prime Minister!!!! Climate change is a very current and serious issue that affects all of Earth's inhabitants. Canada, in fact, has seen a change in climate that is twice as much as the rest of the world. ​To help bring our voice to the people in power, we are creating a box to send to Canada's Prime Minister. A jack-in-the-box Earth, with a little bear holding the sign "time's up"
​The most important thing, as you can see, are the letters we are going to be writing. Besides making a point regarding climate change, they will be a part of your mark for science, as they will help demonstrate you understand what is climate change and what effects humans are having on the environment. In order to complete this assignment, you will need to create a Mind Map. You will select three topics from the ones below. 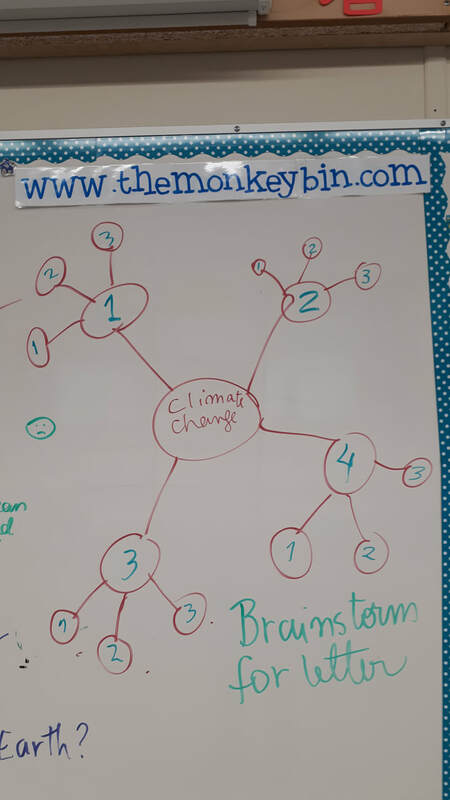 Your classes helped create this list; if you have a different idea for a topic, but it is not below, please feel free to use it, as long as it relates to climate change (we can't dilute our topic). Solutions are already here - such as changing from fossil fuels to cleaner energies like solar, wind and water -- end with a plea for a commitment towards change. Your mind map might look something like the one below. Your mind map should have three main topics minimum. These three (or more) main topics will form the three main paragraphs on your letter. Your letter will include an introduction, three paragraphs (minimum) and a conclusion. From your chosen three main topics, branch out different ideas just like the image below. Why is that topic relevant? What are facts you can mention on your paragraph? In the end, each main topic should have three or more subtopics. Now, create a first draft of your letter. This can be typed, although the very, very final should be done in writing -- hand-written letters have a special kind of power. You can copy from your typed version, no problem. This first draft and mind map are due on Monday April 15th for C1, C3 and C4, and April 16th for C2.